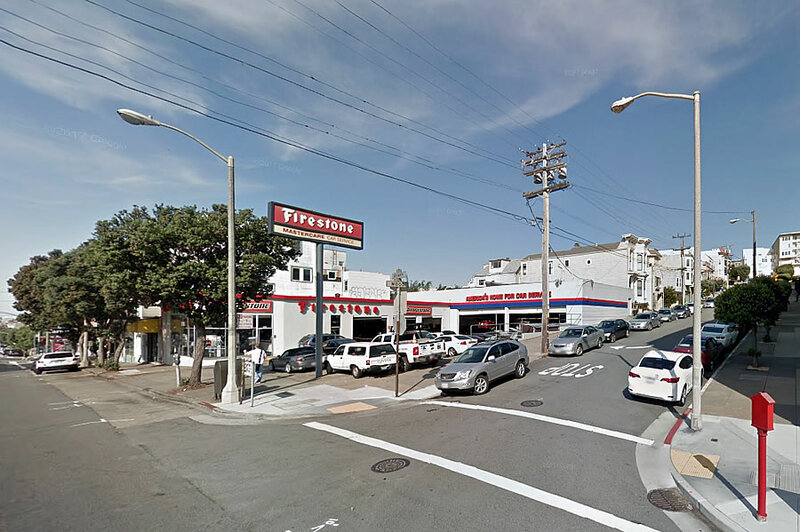 Plans to level the Firestone Complete Auto Care shop at 2800 Geary Boulevard have been drafted. And as envisioned, a six-story building could rise on the Laurel Heights/Lone Mountain parcel, with 44 residential units (a mix of 23 one-bedrooms, 10 twos and 11 threes) over 2,500 square feet of ground floor retail space and a garage for 22 cars with its entrance off Wood. 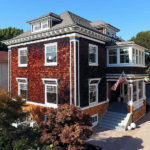 At the same time, plans to level the 3-story medical office building at 3330 Geary Boulevard, between Commonwealth and Parker Avenues, across from Mel’s Drive-In, and develop a six-story building with 41 residential units (a mix of 16 one-bedrooms, 19 twos and 6 threes) are moving forward as well. And while both parcels are only zoned for development up to 40 feet in height, at least in principle, both sets of plans were drawn to leverage San Francisco’s HOME SF bonus height program for their extra height and density as proposed. Awesome! This is my neighborhood – we need more housing here. If San Francisco didn’t have its head up its a, it would have already rezoned the Geary corridor. It is just amazing what passes here. 6 stories is quaint and should be minimum not maximum permitted. (I know, I said this 15 years ago.). New York upzones neighborhoods routinely as we take about 25 years to have conversations. Today’s latest: a former Superfund site. if much of geary were lined with 6 floor buildings, that would be plenty high and could add 10,000+ units just with 6 floors along geary from masonic to 30th. thats 38 blocks, with four 6 floor bldgs per block (228) , thats 45 units (per 6 story buildng) x 228 buildings. thats 10,260 units, which would be a pretty massive amount of new units on 1 street. Sure. And 20 stories would yield more than triple that (and be more likely to pencil across every site, and allow more competition). Why would that amount be so bad? Because we haven’t paid to dig the Geary subway, new dwellers would want to own cars and the West Side/Best Side wouldn’t let it happen. But if we zoned for 20 stories, SF’s tax revenues would increase dramatically, which could be used to pay for the subway. Of course, if SF zoned for 20 stories along Geary, especially if they were overwhelmingly market rate condos, the yuppies with their privately-owned luxury SUV-dependant lifestyle choices would move in and create both a parking and traffic congestion nightmare that would be pretty much irreversible after the ten of fifteen year period it would take to complete the subway construction assuming the maximum revenues could be collected from the sale of those condos. Those people aren’t going to take Bus Rapid Transit, let’s be real here. You can yell “NIMBY” all you want, but the desire of real estate agents for more product to sell doesn’t outweigh the realities of Prop. 13 and private developer’s inability to create affordable housing for current residents of The City. If Geary were to be upzoned to 20 stories the entire fabric would change. The simple take that it would be a bunch of rich folks moving in is nothing supportable. Twenty stories, across 48 blocks, and two sides? that would create, over the course of years, an absolute critical mass. The supposition that only rich people, ever, will move to San Francisco over the course of many years is nonsense as well. The concept that today’s ~1000 per square feet condo unit cannot become tomorrow’s much more affordable real estate is also a fallacy. And I’d go as far as to say that notion is being dispelled almost daily, on this site. One need only look at what several times traded by now loft type spaces are doing. Oh, but it’s all about the realtors. Come on. Upzoning along Geary plus BART to Marin makes perfect urban planning sense to anybody not swayed by buzzwords. Without a subway, six stories is plenty along Geary. This isn’t Europe or Asia…Americans don’t do infrastructure, and without moder transit, Geary will have to remain largely as it is, auto-dependent and sparsely built. It’s a shame really, because otherwise mid-to-high rises would work well here. Bus Rapid Transit is coming to Geary which (while not as good as a subway or rail line) will increase transit speed and capacity.